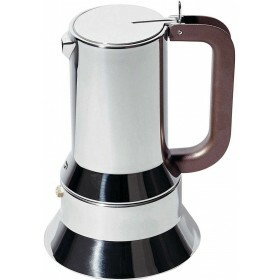 3 cup espresso coffee maker in aluminium casting with 150mL capacity. Black coloured polyamide handle and knob. 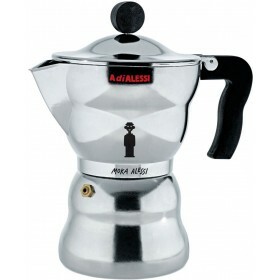 Developed for coffee lovers by Alessi, in collaboration with Illy. 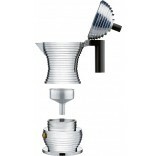 Optimised shape enhances taste and smell of coffee. Automatically stops filtering just before the coffee becomes bitter. 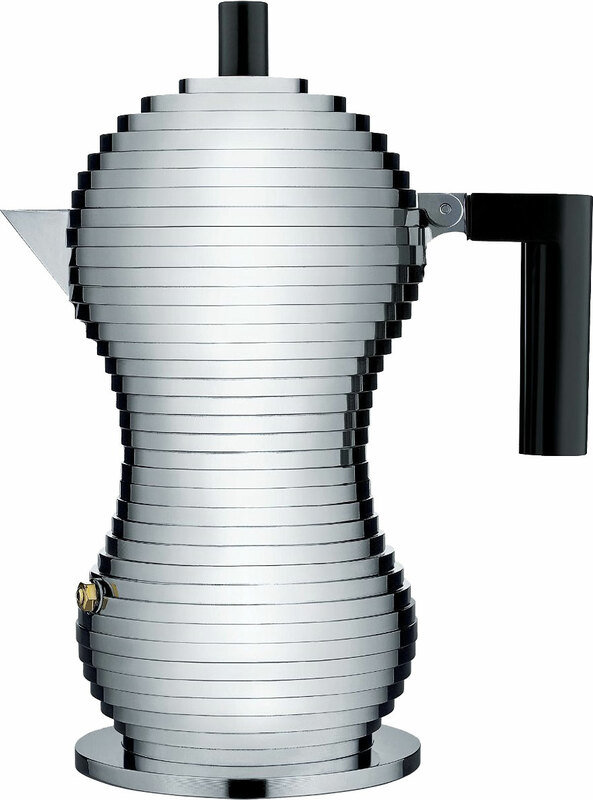 Brainchild of architect Michele De Lucchi, "Pulcina" is the espresso coffee maker dedicated to coffee lovers. 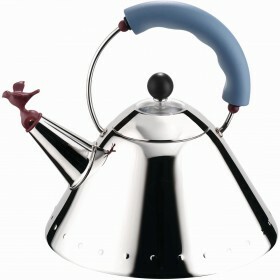 A revolutionary product that combines technology developed by Illycaffè, with Alessi's design experience. 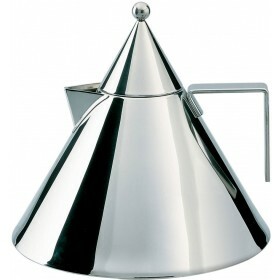 Pulcina is the product of intense research into the optimisation of the shape of the coffee pot in order to improve and enhance the organoleptic properties of coffee. Illy has identified the ideal shape that the water boiler should take to produce the perfect coffee. Thanks to the internal shape of its special heater, Pulcina automatically stops filtering the coffee at the right moment. This interruption helps to eliminate the eruption phase, the final filtering stage that generates a burnt and bitter aftertaste, ensuring that only the finest qualities of the coffee are preserved and enhancing its full-bodied and rounded aroma. 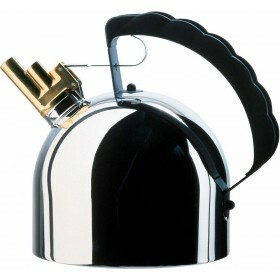 The pronounced V-shaped spout is reminiscent of a baby chick's beak, and is specially designed to eliminate drips when pouring. 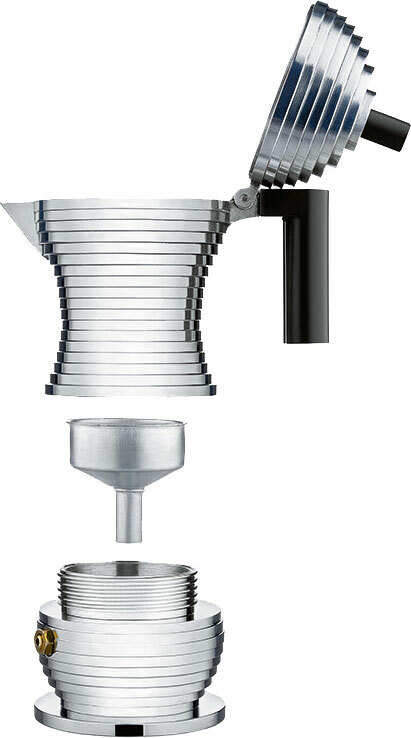 Practical and functional, making coffee with the Pulcina is just like making it with a traditional coffee pot - but with a better result. 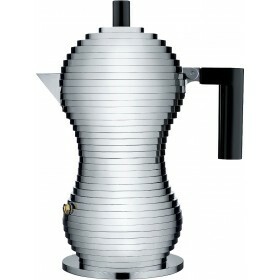 Exquisite design, delicious coffee. Makes my tiny kitchen look very Italian! Excellent service from Teddingtons, too. I was very impressed with the quick turnaround. Thank you.